I’ve been switching back and forth between grilling pizzas on a stone, and on my favorite Doughmakers Pizza Pans. Both methods produce consistently excellent pizzas with slightly different crusts. The stone method makes a more crackly crust and the pan style has more of what I think of as traditional crust. Sort of like good take out pizza. I like them both so much I go between them as the mood strikes. The only way I dislike grilling pizza is placing the dough directly on the grill, I don’t like how you really can’t cook the pizza as one unit, but have to have all the toppings cooked ahead of time. Sometimes the cheese doesn’t even have time to melt before the dough is burnt. Maybe I’m just not talented enough. This pizza was incredible but Dishboy Scott had some trouble with pimientos. He howled about my using them until I told him they're just chopped sweet peppers. Maybe more people would use pimientos if we renamed them. Like how prunes are now called dried plums! We'll call it pimiento public relations. Place water, yeast, and honey or sugar into a stand mixer bowl. Stir to combine and set aside for 10 minutes. Place the rest of the ingredients in the bowl and knead with a dough hook on low speed for 5 to 10 minutes. Remove the dough from the bowl and knead by hand on a clean surface for another minute. Pat into a circle. Lightly oil a large bowl and place the dough inside, flipping once to coat with oil. Cover and let rise in a warm place for 30 minutes. This recipe is written so you can add as much or as little topping as you like. It will taste the same as mine as long as you stick to the cheese proportions. Then again, feel free to change it to your tastes. That’s the fun of making pizza after all. 1. Turn grill to high heat. Temperature needs time to climb between 500 and 600 degrees. Set on a square pizza stone if using. If not sprinkle a good quality pizza pan with coarse cornmeal. 2. Drain canned tomatoes and puree in a food processor until smooth. Set aside. Halve or quarter mini tomatoes depending on size, place on a paper towel covered plate and salt well. After a few minutes pat dry. 3. Pat out pizza dough with hands rolling as needed. Move to cornmeal sprinkled pizza pan or to a cookie sheet with cornmeal covered parchment for the pizza stone. Make sure the parchment is cut to the size of the pizza stone or it will burn. 4. Lightly brush dough with olive oil and spoon on about half of the tomato sauce. Top with mozzarella and Asiago. Top with tomatoes, onions, pimientos and minced garlic to preference. Top with Pecorino Romano and sprinkle with dried oregano, salt and pepper. 5. Slide the pizza with the parchment onto the pizza stone or set the pizza pan directly on the grill. Close the lid and cook for about 5 to 8 minutes or until bottom is well browned and top is bubbly. Please come and make me this for dinner. 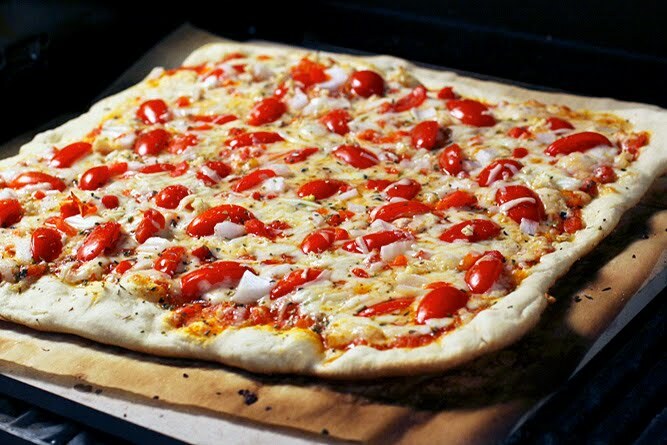 I just love pizza, and seeing this with all the beautiful little tomatoes is making my stomach hurt in hunger. So gorgeous! Looks like a great pizza! Love the 3 cheese combo! Pimientos DEFINITELY need a new name. They sound quite unappealing as is even though they are super delicious! I love this pizza! I wish I had some insight into grilling for you...but I've never done it before. I've been pushing to get my stone to give me a truly crackly pizza crust... and it just won't do it. I'm starting to hold my oven suspect. That said, you're allowed to bring me pizza any day of the week. This looks fabulous. What a lovely pizza!! Everyone is blogging about pizza lately. I think I need to get on this renewed pizza bandwagon and make some soon. your pizza looks phenomenal!! wow, after you make Monet one, can I have one too! When my husband and I grill pizza we actually set the dough right on the grill. It cooks faster (I would assume), so you have to be quick at topping it, but tastes so good when it's just slightly charred. It looks like your techniques are working as well though...this looks delicious! Laura, Is that really what pimientos are? I've been holding out since I was a "picky eater" child. I'll have to give them a try. I LOVE my stoneware...It's the only thing I'll bake my cookies on! Your pizza looks great! Just lovely! Best looking pizza I've seen in quite a while! With recipes like this one, you have yourself a nice, long career in pimento public relations. Looks delicious! great recipe and great picture! I keep getting upset because we don't live close, I would love to try one of your homemade pizzas.Next time you come to NY I am going to make you bring one in the plane! GAH! Everywhere I turn there is amazing grilled pizzas. I think divine intervention is telling me I MUST GRILL A PIZZA. Okay, okay it's on the list. The last blogger post I read about it the grilling method said to grill the dough for a few minutes on one side then flip and top and finish the grilling. Hmm...it sounds like this might take me a few tries. My goodness this looks delicious and now I am hungry. Thanks for sharing the delicious pizza recipe with us. This pizza looks amazing. Is the dough recipe, one that can withstand directly putting on the grill? Mine generally have a tendency to fall apart as I try picking it up to put on the grill. I'm not sure this will help but make sure your dough isn't too dry and also knead it like crazy. The more gluten that develops the less likely it will be to fall apart. I use part bread flour in this dough and that might help too. I don't have tons of experience with direct grilling so these are just suggestions that I'm thinking might help. Thanks for the update Laura. I think changing to bread flour might be what I need. I have always used the standard unbleached flour.